The incoming freshman thinks he'll be back soon. Also, Peter Jok and Cordell Pemsl play a combined 20 seconds. NORTH LIBERTY, Ia. 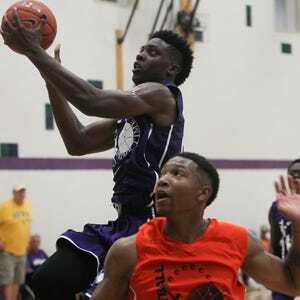 — The tallest of Iowa’s five incoming freshmen isn’t playing in the Prime Time League this summer, but he was on hand for Thursday’s opener at the North Liberty Community Center. Ryan Kriener, a 6-foot-9, 240-pound forward/center from Spirit Lake, said the illness that is keeping him out of action still hasn’t been identified. But he doesn’t seem worried about what it could be. Kriener said he had a handful of workouts before he was sidelined. In that time, coach Fran McCaffery used he and 6-foot-8 freshman Tyler Cook a little differently. Kriener, despite his size, is able to extend defenses, while Cook is more of an around-the-rim presence as he showed with a 27-point, eight-rebound PTL debut. Kriener isn’t yet sure whether he’ll redshirt. Iowa’s frontcourt is already pretty crowded. Maishe Dailey was a late addition to the 2016 recruiting class, signing in May after the transfers of Brandon Hutton and Andrew Fleming opened up a scholarship. A month later, the 6-foot-6 combo guard and former Rutgers commitment was in the classroom at Iowa. New teammates got to see Dailey run around the Iowa locker room with joy when his hometown Cleveland Cavaliers won the NBA title recently. Fellow Ohio native Ahmad Wagner has been proactive in taking a leadership role with Dailey. He looked smooth but didn’t take many shots in his PTL debut, scoring seven points with four assists. Senior Peter Jok and freshman Cordell Pemsl are PTL teammates, but neither really played Thursday. Jok sat out with a foot injury. He’s day-to-day. And Pemsl? Well, in the very first minute of action he was poked in the eye and crumpled to the court. He was OK, laughing on the sidelines with Jok, but he didn’t play after that as a precaution. Cook was the highest-scoring Hawkeye, with fellow freshman Jordan Bohannon tying his 27-point output. In the later games, redshirt freshman Isaiah Moss scored 24 points with five rebounds in his PTL debut.